There is a good reason why Gilbert and Sullivan operettas (or “operas” as they called them) are always with us. When well sung, well acted, well directed and elegantly staged, there are few works anywhere that provide greater entertainment for a wider audience, from schoolchildren to pensioners. No librettist ever offered wittier or more beautifully shaped lyrics, with more intricate rhyme schemes than W. S. Gilbert. Last night’s Patience, presented by Odyssey Opera under the direction of Gil Rose and staged by Frank Kelley, was simply a triumph, receiving the kind of audience response that would have delighted Gilbert and Sullivan themselves when the work first appeared in 1881. 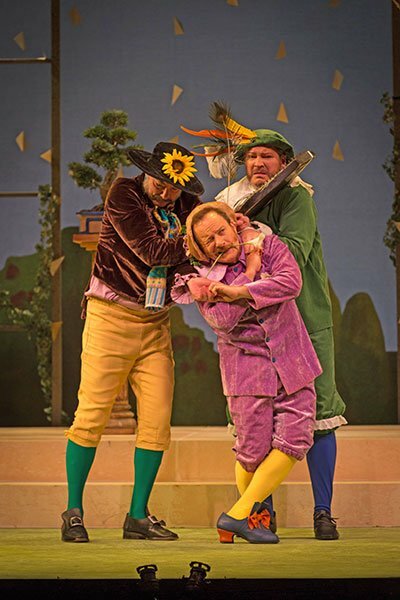 What makes any Gilbert and Sullivan show work as well, as Patience does in this production is the presence of real singers who are also fine actors. That seems obvious enough, but many have been the productions of these works in which good comic actors have lacked the voice or good singers did not have the acting chops. Such was not the case in the Odyssey Opera production. In the principal male roles of the rival poets Bunthorne and Grosvenor, Aaron Engebreth and Paul Max Tipton were perfect foils for one another in their different “aesthetic” styles. Engebreth was the moody and fitful poet, pretending to be aesthetic in order to attract a crowd of young female followers. His “poetic” mannerisms and his costume – an avocado velvet suit, long hair, with a long-stemmed flower in his hand – was gloriously parodistic, and funnier still when he explicitly reveals to the audience that he is phony. Tipton, as Grosvenor, plays his character’s amour-propre for all that it is worth, made all the funnier because it seems to be essentially innocent on his part. James Maddalena brings years of experience as a singing actor to the role of Col. Calverley, a sturdy British officer with all the sense of entitlement that come with the rank, yet amusingly confused about the ladies’ passion for an aesthetic poet. He could run off the recipe for a Heavy Dragoon in Gilbert’s complicated patter lyrics and in the next moment show he was fully in charge of his regiment. His second act attempt to try appearing aesthetic was a highlight. Gilbert and Sullivan tenors all too often sound reedy and underpowered. This was not at all the case with Steven Goldstein, who filled the role of the Duke of Dunstable most happily, both in his lyric tenor, which had a lovely float, and in his stalwart acting as the smallest, yet socially most prominent, of the soldiers. The third of the officers, Major Murgatroyd, was smartly played by Sumner Thompson, whose voice and antics beautifully matched those of the other two officers. Perhaps surprisingly, the biggest hit in the show was made by Janna Baty as Lady Jane. This would be no surprise to anyone who has heard her in previous performances here in which she showed both her vocal art and her remarkable acting ability. I particularly remember the tragic role of the Duchess, extremely challenging both musically and dramatically, in Thomas Adés’s Powder Her Face in 2003, and the extremely funny performance of the widow Popova in William Walton’s The Bear two years ago. The surprise comes because Lady Jane is one of those older female characters, of whom it is often said that Gilbert was cruel in their dramatic treatment. To be sure, Jane is considerably older than the other lovesick maidens of the chorus, yet she has a strength superior to any of them, and a common sense beyond theirs. And in the person of Janna Baty, the role of Lady Jane has an actress/singer who can play it for full strength and full comic effect. was usually performed with the actress holding a double bass, or perhaps a cello, in order to mime the bass line of the orchestra, which is by turns both poignant and dramatic. Until this production, I had never seen Lady Jane actually play the cello while singing the number. It seems that Janna Baty studied cello as a girl, though she says she has not touched it for well over a quarter-century. Nonetheless, her determined performance on the instrument played right into the character of Lady Jane and made the number one of the highlights of the show. So overwhelming was the audience response that she actually broke character and returned to the stage to take a bow before the show could continue. And, amidst a cast received with great enthusiasm during the curtain calls, the response to her appearance was utterly ecstatic. Frank Kelley, the stage director, is well known in Boston musical circles for many years of varied activity as a tenor. This was his first appearance as a director for Odyssey Opera, though he actually appeared in a singing role in the first opera of this Oscar Wilde-based season. But in Patience showed real talent in a new capacity, with an excellent sense of directing actors for comic effect and employing the space on the stage when there is a large mass of people moving around, as always happens with two choruses and soloists in a Gilbert and Sullivan production. Seeing this hitherto hidden talent revealed so effectively is one of the specific pleasures of this production. Gil Rose’s range as organizer and conductor of Odyssey Opera (as well, as of the Boston Modern Orchestra Project) is so well known that it hardly needs reporting here, except to say that once again he has chosen musicians of exceptional quality for the stage, as well as a first-rate orchestra of modest size (twenty-seven instruments — fourteen strings balanced by six winds, six brass, and one percussion) to play Sullivan’s marvelous orchestrations. His theatrical timing, too, is also well known. In this performance, responding to audience enthusiasm, he allowed two encores, to the audience’s delight: the duet of Bunthorne and Lady Jane, and the duet of Bunthorne and Grosvenor. Choreography—both delicate and amusing—was by Larry Sousa. Dan Daly designed the two sets, both with an “aesthetic” feel to them. 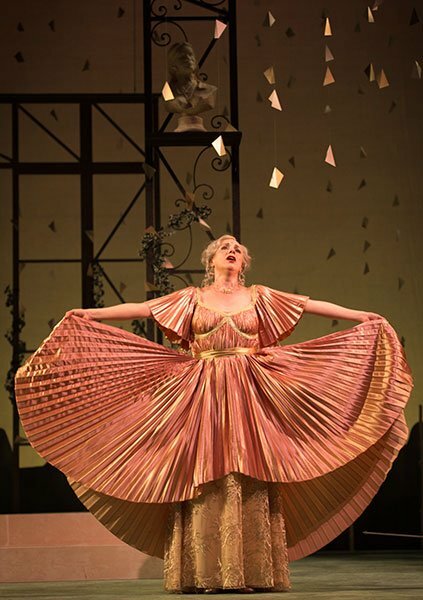 Costumes by Amanda Mujica, with hair and make-up designs by Rachel Padula-Shufelt equally captured the spirit of the piece with variety, charm, and wit. Christopher Ostrom did the lighting design. It is a shame that Patience runs only twice because it should be seen by many, many people, especially audiences relatively new to the theater who may not know the work of Gilbert and Sullivan at all, and who would be amazed and delighted by effects produced in the old “simple” style of theatrical production, with only one set per act, and emphasis on the witty story, the brilliant words, and the ever-delightful music. Patience was the perfect ending to an Oscar Wilde-based season that offered an opera based on his one novel, another setting a compact form of most famous play, and a third based on a short story. Finally we end with a work in which he was possibly parodied to some degree, and also involved in its marketing and fame. But most of all, Patience was simply an utterly delightful evening in the theater, whether for Savoyards of long standing or newcomers to this brilliant repertory. Ed. Note: A paragraph on the three soloists from among the “rapturous maidens” chorus accidentally deleted from the the original submission has been restored. It is always a pleasure to see G&S performed by professionals, and this one was no exception. I am in almost total agreement with Steven Ledbetter on this review, though I have a few further observations. First off, the orchestra was superb, and hearing a first-rate performance highlights how tricky Sullivan’s seemingly effortless writing can be to play. Second, not only was Steven Goldstein spot on in his acting and singing, I got a chuckle out of the fact that the quality of his voice is so similar to that of…Frank Kelley! And third, yes, I have seen Lady Janes play the cello (the libretto does call for it, meaning presumably that the singer who first played the role could do so), and it’s great that Janna Baty has that skill in her background (and she made the most of it). Oh, and did I mention, that Aaron Engebreth is simply the best Bunthorne I have ever seen? My only quibbles with the production were that, first, while it’s marvelous to have a real opera singer of James Maddalena’s caliber taking the patter baritone role, doing G&S patter songs is a specialty in its own right, and Maddalena just couldn’t spit out all those syllables with the clarity you get from lesser singers who train assiduously for this kind of part. And second, there were a couple of places where Kelley’s direction undercut Gilbert’s lyrics, as where Bunthorne is supposed to feign aloofness from his admirers, the better to counterpoint lines like “round the corner I can see/Each is bending on her knee.” Here, Kelley had Bunthorne in the midst of the women, where he could not avoid paying attention. Still, these are just quibbles, and if anyone has the slightest interest in seeing how G&S is performed when done properly, they should get to tonight’s performance. Janna Baty OWNED the stage with her every appearance but her big number was the crowning achievement. I have never seen a Lady Jane who began to approach what she achieved, her whole performance illuminated by joy in performing. Having written a role for her in the libretto of an opera some years ago, I also know her to be a great colleague. My husband and I travelled from Roanoke Virginia to see our favorite opera performed, and the performance was more than vaut le voyage! My only sorrow is that we did not manage to connect with the other dear friends who attended the performance Friday night (and commented on the wonderful review). Many thanks to Sara Heaton, Stephen Goldstein, and of course our Janna. I”m surprised you were surprised at her astonishing characterization of Lady Jane, Stephen! Janna can do ANYTHING, including play the cello brilliantly. Many thanks to Odyssey Opera and to Gil Rose. Whatever Janna, surprisingly, cannot do, Gil certainly can!